The Coastal Path leading west out of Newhaven takes you up and over the cliffs, via Castle Hill. Before we started the climb towards our exit from the town, we wanted to explore the western breakwater, underneath the cliffs. We circled round Castle Hill and found a quiet oasis of tranquility. The outgoing tide had rendered the sands completely flat. 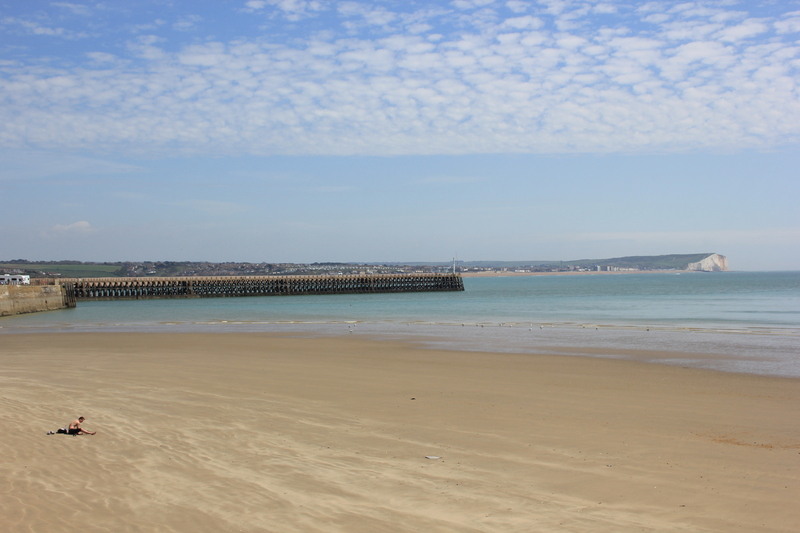 A solitary sunbather had the beach all to himself – lucky man! 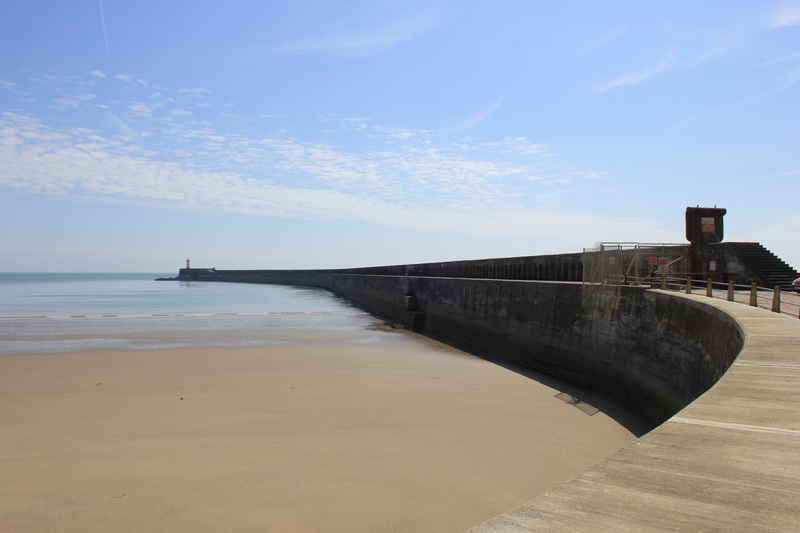 At the western end of the beach was the Newhaven breakwater. Built in 1890, the present-day breakwater is the second to have been built here. Both the modern arm and its predecessor were designed to prevent longshore drift and the silting up of the River Ouse. The Ouse had already shifted west, from Seaford to Newhaven, in medieval times. In fact, Newhaven was built as a result of that shift. If the breakwater had not been constructed, the Ouse would have continued to have silted up and carried on its journey west. The purpose of this structure was to arrest the shifting sands, but it also happened to arrest my senses! It was beautiful! What a pity it was closed to the public and impossible to walk along. There was little choice but to turn back the way we had come (there is no path beneath the cliffs) and start the climb up Castle Hill and out of the town. The path took us up towards Newhaven Fort, built in the 1860’s. We passed the entrance, but did not go in. Newhaven Fort was not the first fort to be constructed here. Castle Hill has been used as a defensive position since the Bronze Age, some 3,000 years ago. 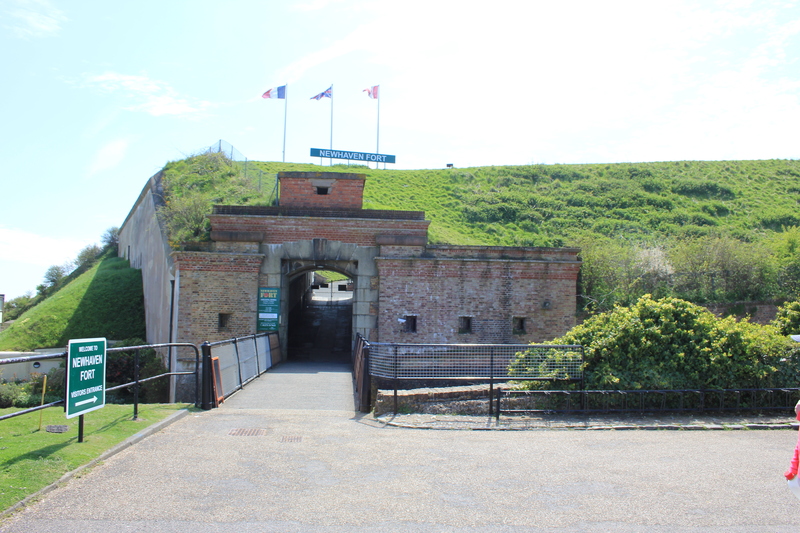 Newhaven Fort is the largest defensive work built in Sussex. Although we didn’t go in, we saw quite a few defensive structures along the cliff top. 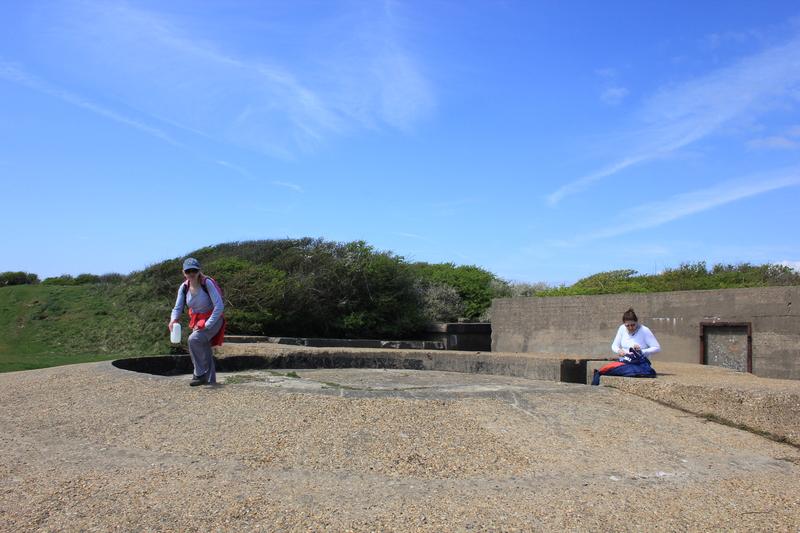 Gun emplacements and concrete buildings jumped out of nowhere at us. We could explore these areas unchecked. I am so pleased these places exist. Preserved and restored buildings, opened to the public as formal museums, have their place, but so do bits of history that you can roam around and clamber over unchecked. There are no information boards or digital tour guides to tell you about where you are standing. There is only imagination, and that will often suffice. The fort is not the only structure on Castle Hill. 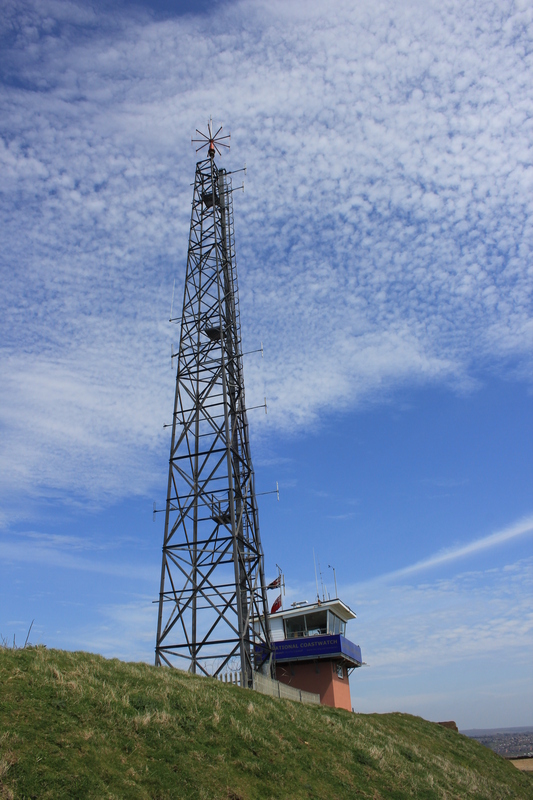 There is also the Newhaven National Coastwatch Institution Lookout Station, standing tall and proud. It is one of 49 stations positioned along the British coatline. With a last look down towards Newhaven’s harbour arms, we turned and set off, forever west, towards Peacehaven. 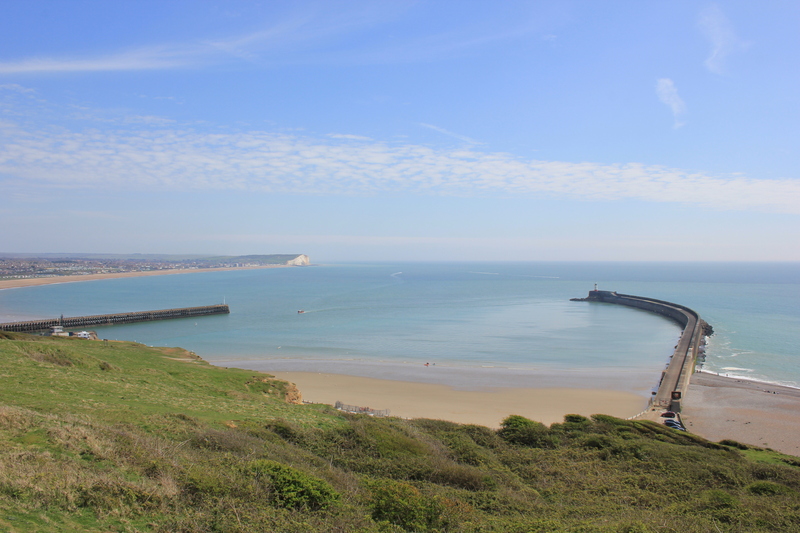 This entry was posted in East Sussex and tagged breakwater, coast, East Sussex, fort, newhaven, travel, walking. Bookmark the permalink. Wow, I can see forever from up here! Is that a French tricolour flying over Newhaven Fort? Lord Palmerston would be shocked! Oh, I don’t know – perhaps he’d be pleased to see that someone found a use for his fort!